At the time, the fulcrum of the burgeoning field was hooliganism in British football. But through these investigations, the idea of football rooted in working class communities cemented itself. Despite spreading, in the early years, via merchants, colonisers and the travelling bourgeoisie, football is now viewed as the game of the workers, of the streets. The central contention of football fandom is that when the 22 players step onto the field, they are representatives of a wider group of people, often an industrial, working class community. The strength of football’s identification with the working class has, in recent years, spawned advocacy groups, keen to fight the hyper-commercialisation of the game and the embourgeoisement of the terraces. The idealised notion of “jumpers for goalposts”, of working class kids battling on cobbled streets, as popularised by films such as Jimmy Grimble, now competes with oligarchs, billionaires and, in the words of former Manchester United captain Roy Keane, the “prawn sandwich brigade”. In Russia and the former Soviet Union, football’s identification with a community, imagined or otherwise, is muddied by the involvement of institutions. Rather than representing a district, town or city, as in much of the football world, Soviet teams often incorporated an industry, institution or even specific factory. CSKA, the Central Sports Club of the Army, represented the Soviet armed forces in Moscow; Lokomotiv the railway industry; the Dinamo clubs, especially in Moscow and Tbilisi, the police and secret services. Even today, fans of Torpedo Moscow chant “we are the Avtozavodsky club”, referencing their links to the ZIS Auto Works factory in Moscow. But throughout Russia, despite the prevalence of industrial urban areas and a strong working class culture, football has, in some parts, failed to take root. In Nizhny Novgorod, one of the 11 cities hosting the 2018 World Cup, local football culture has failed to sustain a series of professional clubs, despite a strong industrial heritage. Like the fans of Torpedo Moscow, the residents of Nizhny Novgorod have their own automobile factory, the Avtozavod, around which a team could have coalesced. Built in the 1930s, the city’s factory district housed 100,000 workers, fitted out with the latest dreams of Soviet urban utopianists. Today, the district is reduced, but residents remain and the factory is still in operation. Many of the cultural amenities built to offer residents leisure time have closed, or given way to the pressures of free-market capitalism in the New Russia. The football stadium in the area also struggles, without the patronage of a professional club. Instead, amateur teams from across Nizhny Novgorod Oblast visit on cold weekends for the Winter Championships. In the years following the dissolution of the Soviet Union, professional football in Nizhny Novgorod struggled. Teams rose, for a few years, before falling into obscurity. In the 1990s, Lokomotiv Nizhny Novgorod competed in the Russian Premier League. They even reached European competition, making it into the Intertoto Cup, a now defunct tournament that acted as a preliminary to the UEFA Cup. But financial problems eventually set in, so often the curse of burgeoning football cultures across Russia’s embattled regions. Lokomotiv were ultimately relegated from the Premier League, falling into obscurity and out of business. Now, reformed as an amateur team, they compete in the regional winter leagues. After Lokomotiv’s decline, the regional authorities were involved in the formation of Volga Nizhny Novgorod, who eventually reached the Premier League. But, like their predecessors, a few years of success gave way to financial struggles, relegation in 2014 and extinction a year later. In the years between the fall of Lokomotiv and the rise of Volga, Nizhny Novgorod’s football fans were left without a team. The shared community identity produced by the two local clubs was missing. Instead, a “lost generation” of fans looked elsewhere. Unable to ground themselves in locally-based identities, many fans who came of age in the early 2000s directed their attention towards the Moscow clubs. Some looked even further from the confines of their home city, in the direction of England and Spain. Mason’s conceptualisation of “district, village, town, city or county” or “class, colour or country” gave way to other concerns. Fans looked for teams whose style of football they enjoyed, whose jerseys they found aesthetically pleasing or for whom their favourite players turned out. And once support transcended local concerns, it was difficult to re-establish some sort of bond. Now, Nizhny Novgorod is represented by a new team, FK Olimpiyets Nizhny Novgorod, founded in 2015. They compete in the unglamorous Russian second tier, with teams from Kaliningrad to Vladivostok. But establishing a local fan base has not been simple. Until April, when the city’s new stadium opened, Olimpiyets were playing in the city of Dzerzhinsk, about an hour’s drive from Nizhny Novgorod, attracting crowds of just 1,000-2,000. In April, in their final game in Dzerzhinsk before moving to the new stadium, just 500 people turned up, with many staying at home to watch teams from Moscow, England or Spain on television. The move to a new, modern sporting arena provides a sense of hope for Olimpiyets and the local authorities. 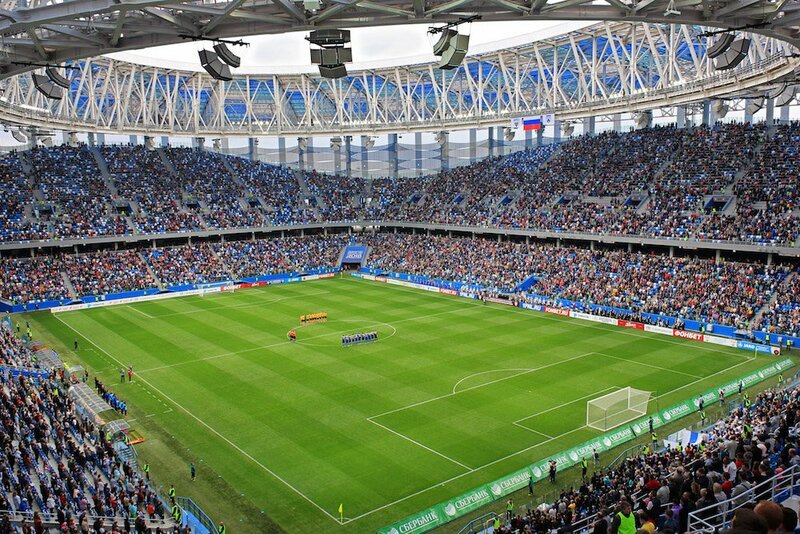 In one of the test matches ahead of the World Cup, 26,800 fans came to the stadium to watch Olimpiyets take on Rotor from Volgograd, just two weeks after just 500 journeyed to Dzerzhinsk. While representing just over half of the total capacity of the new stadium, this attendance was cheering, according to a source within the city’s World Cup Organising Committee. He suggested that, should Olimpiyets improve, and talented, exciting footballers arrive in the city, fans would begin to adopt their new local club. In his view, success could act as a catalyst for a new generation of football fans and a few returning locals who had directed allegiances elsewhere. In Nizhny Novgorod, with the right marketing, stadium experience and community ties, Olimpiyets have the capacity to engender affective ties from local residents. There is an existing football culture in the city, evidenced by the sustainability of the Winter Championships and the packed pubs and bars that show football from around the world, but it needs to be targeted towards a locally-rooted supported identity. In a globalised world, football allegiances are not always rooted in geographical solidarities. But there are examples within Russia that offer hope. In the southern city of Krasnodar, smart investment from supermarket billionaire Sergey Galitsky and a series of decent coaches has created a team that has locals and domestic football fans more broadly paying attention. The emergence of FK Krasnodar has demonstrated that a new stadium, a strong local identity and an exciting set of players can produce a football culture from the ground up. For the city of Nizhny Novgorod, with its larger population and deeper football history, the Krasnodar model proves that it can be done.